President Emmanuel Macron’s gas taxes and policies stirred up opposition from France’s right-wing and left-wing populists. French officials temporarily suspended an unpopular gas tax increase, but it might not be enough to save Macron, as he battles left-wing and right-wing populists. The protests were responsible for millions of dollars in losses and three people ultimately lost their lives in the chaos. French President Emmanuel Macron’s gas taxes created a toxic situation that eventually led to the country’s largest riot in nearly a decade, though many of his policy reforms are driving much of the movement. 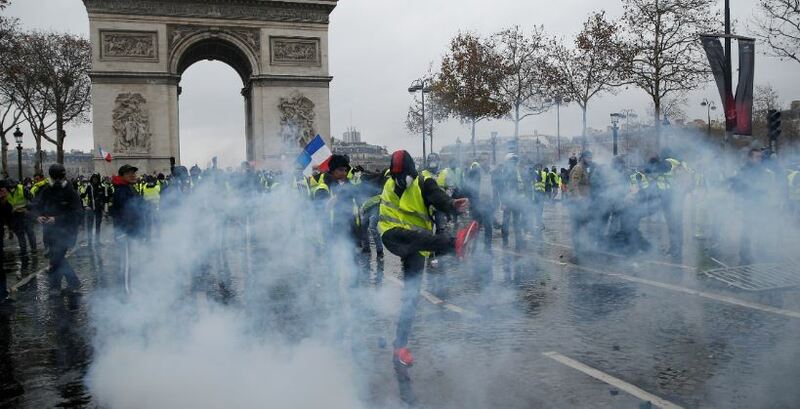 France temporarily suspended a gas tax Tuesday following weeks of protests from protesters associated with the so-called Yellow Vest movement. The bulk of those protesting are from rural parts of France and work as truck drivers, caregivers, and other middle-class jobs. Hundreds of thousands of people flocked to Paris and the outer-lying areas to protest, and hundreds were arrested over the past few weeks as demonstrations turned violent. The protests were responsible for millions of dollars in losses and three people ultimately lost their lives in the chaos. The turmoil also highlights a growing rift between urban areas where people feel less of the sting as they rely on public transportation and rural areas, where citizens are struggling to keep up as prices skyrocket and taxes threaten to consume their incomes. Many people living in rural areas pay the equivalent of hundreds of dollars per month on gas. He enacted a gas tax increase in January that is causing prices to pitch upward. French citizens are currently paying $1.73 per liter in American dollars, which is roughly $6.57 per gallon. The bulk of the price comes from oil prices increases – France gets nearly 99 percent of its fuel from imports. But the gas tax increase, enacted in January, is equivalent to up to 25 cents a gallon. Much of the angst is originating in rural areas where the National Rally holds sway. The RN was formerly known as the National Front, a broadly right-wing group headed by firebrand Marine Le Pen. Those in this group feel France’s aristocracy is abandoning the country’s middle class, which is heavily taxed but doesn’t earn enough to received subsidies. It has also gained the support of leftist presidential hopeful Jean-Luc Mélenchon and some representatives of the country’s Republican Party, but has not yet been endorsed by any of France’s labor unions, or by truck drivers organizations. Left wing groups have their own reasons for opposing Macron and supporting the thrust of the Yellow Vest movement. The bipartisan and largely uncoordinated nature of the Yellow Vest movement is making it difficult for the government to determine how to satisfy the protesters. France’s protests typically are well orchestrated and driven by labor unions, student groups and politicians. Macron scrapped France’s wealth tax in 2017 that many believe scares off millionaires and hurts France’s economy. Opponents used Macron’s move to brand him as the “president of the rich,” a label the wealthy Frenchman has struggled to shake off since taking office in May. He has also largely eschewed the consensus-building approach of his predecessors, and instead wielded his executive powers to defy political opposition. Macron’s public comments about the reforms are not helping his cause. “It’s all well and good to want to spread wealth, but you first need to produce, to create wealth before redistributing, that’s how it works,” he told journalists in October 2017. The former financial banker argued that taxes on the wealthy was holding back France’s economy. France was left as the only EU member with a wealth tax after many European countries began abolishing theirs – the charge was the brain child of Socialists in the 1980s who levied the tax on individuals with assets above $1.5 million. 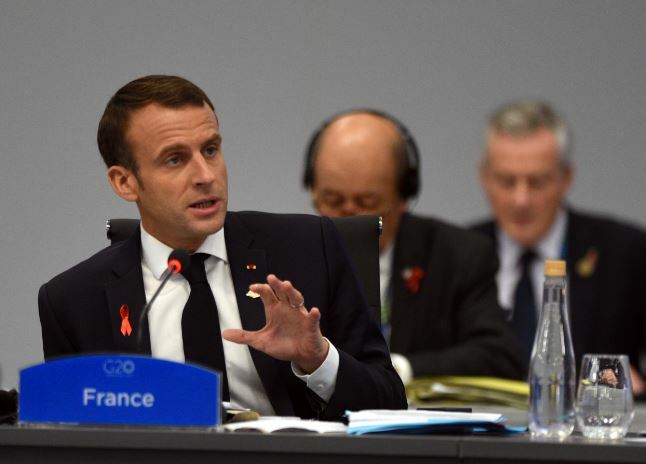 Only 26 percent of French people say they have confidence in the embattled president, according to a poll from Kantar Public, which surveyed 1,000 people in October. Macron’s approval ratings are below those of former French President Nicolas Sarkozy and barely above those of his socialist predecessor, François Hollande. French protesters have inspired a movement in neighboring Belgium, where protesters took to the streets on Friday for broadly the same reasons. There have also been small-scale protests in Canada over Prime Minister Justin Trudeau’s plan to impose a federal carbon tax on provinces unwilling to combat climate change.